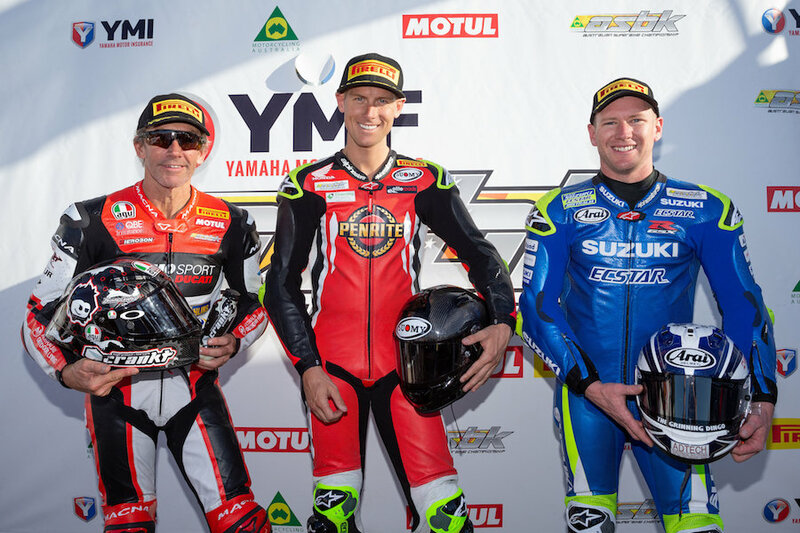 The YMI Superbike Championship leader Troy Herfoss (Penrite Honda Racing, CBR1000SP) has taken out the Elite Roads Superbike Pole Position award here at the Yamaha Motor Finance Australian Superbike Championship presented by Motul Pirelli (ASBK) with a sizzling new fastest lap recorded on a motorcycle at Morgan Park, a 1:12.651. Herfoss is looking like a man on a mission this weekend, and the Honda rider collected the lap record, as he sets his sights on extending his championship lead. “Really happy, its been a few rounds since we have been on pole. It felt good to have great speed on the bike, as we have good race pace and one-off pace. The conditions today were a lot tougher this afternoon than this morning, so my time in Q1 was enough,” finished Herfoss. 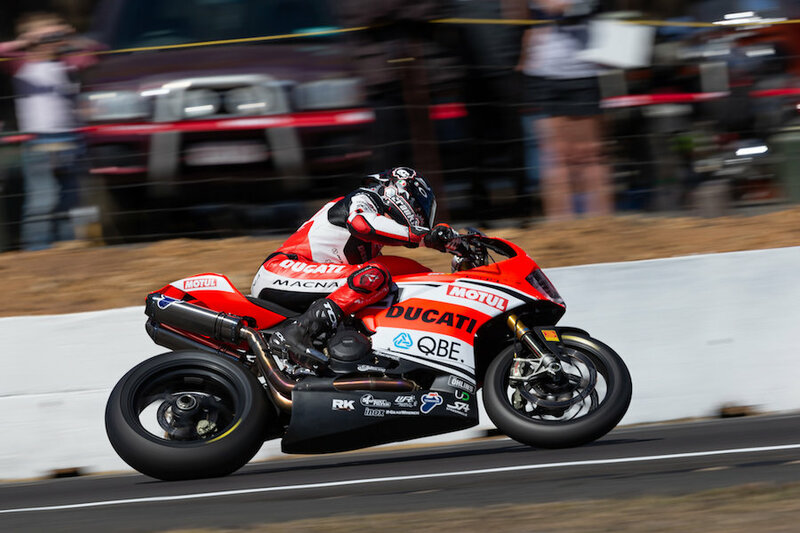 After leading the way Friday, Troy Bayliss (Desmosport Ducati, 1299 FE) would end yesterday’s qualifying in second position but only missed pole position by just over .100s with his lap of 1:12.784. The battle of Troy is on today, with the pair the only riders to enter the 1:12’s lap time area, and after their tantalising battle at Darwin, today is going to be a beauty. Josh Waters (Team Suzuki ECSTAR, GSX-R1000R) has found a good grove here at Morgan Park, qualifying third fastest with a time 1:13.070. The defending YMI Superbike Champion will be eager to turn his front row grid position into two solid race performances today. The Wayne ‘Train’ Maxwell (Yamaha Racing Team, YZF-R1M) will start from fourth on the grid as he stopped the clock at 1:13.127, Maxwell will be desperate to get a good start and track down Herfoss, as he sits 29.5 points behind in the race for the title. Rounding out the top five was Bryan Staring (Kawasaki BCPerformance, ZX-10R) who is continuing his strong showing from Darwin, with a time of 1:13.682, he will be one to watch in today’s racing. Daniel Falzon (Yamaha Racing Team, YZF-R1M) will go into today knowing he has the speed to compete for a podium position, as he qualified sixth fastest with a time of 1:13.745. A rider who is starting to find his feet in the YMI superbike class is Mark Chiodo (Team Suzuki ECSTAR, GSX-R1000R) who put his Suzuki well inside the top ten, qualifying seventh fastest after a fastest lap of 1:14.135. Leading the way for the privateers was Matt Walters (Swann Insurance Superbike, Kawasaki ZX-10R) who qualified comfortably inside the top ten, he will line up from eighth after his lap of 1:14.223. Queenslander Kyle Buckley (Kawasaki BCPerformance, Kawasaki ZX-10R) has booked himself ninth place on the grid with his 1:14.469. On his new Honda Arthur Sissis (SA Demolition & Salvage, Honda CBR1000SP) rounds out the top ten after stopping the clock at 1:14.530, looking for his best finish of the season in today’s races. The YMI Superbike paddock will be back out on the tarmac today with race one at 11:30am and then race two at 1:45pm. Its all set up for a battle for the ages today and it can be viewed on SBS, Fox Sports and all-day Livestream. Check your local guides.